For you, me and most other people, underground train systems are just another part of the working day. Waiting on platforms sleepy and bleary-eyed, being crammed into the carriages whilst trying to pretend it’s totally not awkward being pushed up against strangers; it’s all part of your daily grind. In this rush, we often neglect the technology that goes on behind the scenes in public transport systems. This is exactly why Dice – formerly the IT Job Board – investigated the tech behind the scenes of our very own London Underground. The oldest underground railway in the world, the Tube has come a long way since it first opened in 1863, and today TFL (Transport for London, the governing body responsible for the Tube) is constantly looking into making travels easier for their passengers. Phil Young, Head of Online at TFL, gives us an excellent example of how the latest tech has been integrated into the Underground to make it more passenger-friendly. “Getting the latest travel information direct to customers when and where they want it is key to enabling them to make the best possible journeys, avoiding delays or closures. Read on to find out about the tech behind the rest of the Tube. You never know, you may even develop a new-found appreciation for transport tech! How Does Oyster Card Work? We rely on these trusty little blue cards to get us through our journeys, but the tech behind them is pretty fascinating- they’ve come a long way from when they were first introduced in 2003. In 2003, the first Oysters in use were just everyday cards with a basic microchip: the MIFARE Classic. But these presented a problem. Basically, because they were just simple memory cards which only had enough capability to perform one specific task: to store information. However, they were also used by various institutions for other purposes, such as employee cards. This meant that thieves can easily clone other people’s smartcards to travel for free. This was not the only problem. Because the same MIFARE microchips were also used by ID cards for employees, this meant criminals could use Oysters as an ID to get into employing businesses for espionage or other nefarious purposes. This is why Oysters soon switched to RFID technology: the same used by credit card readers, clothing tags, and tons of other, everyday stuff we use. RFID, or Radio-Frequency Identification, uses radio waves to share information between a card and its reader. This, combined with other technological improvements means the information stored on your Oysters are A LOT safer. For instance, the latest Oysters are essentially CPUs (albeit smaller and more basic than your actual desktop) that are capable of basic computing tasks, including storing files. Importantly, they are capable of encrypting the data stored on the card, hence making them far more resilient to being hacked than the original generation of Oysters. One major plus is that Oysters do not require a power source. Instead, the weak radio waves emitted by the ticket reader will transmit energy, generating power created by electromagnetic induction. RFID is the same type of technology that is being used by NFC (or Near-Field Technology) in our phones and other contactless technology. An additional plus is that the NFC readers only work within 4 feet of each other, meaning that other devices from nearby can’t easily steal your information, so your info is more secure. Installed essentially in any public place where we have to get from one level to another, escalators are yet another form of tech that we arguably take for granted. All escalators move on infinite loops created by two gears: on the top and bottom, that are constantly in motion thanks to a 100-horsepower electric motor that drives the top gears. The gears move the attached belt, as well as the handrail, which is configured to move at the same speed as the steps. Why? They’re under a lot of pressure! 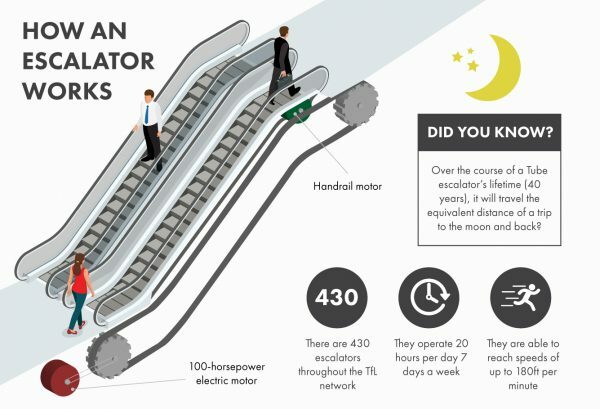 They carry roughly 1.3 billion passengers a year and within the course of a typical 40-year lifespan, an escalator would have travelled the equivalent distance of going to the moon and back. That is exactly why tube escalators have some extra qualities: they have full suppressions, communication and fire detection systems, which have to be strictly tested and approved. Repairs and refurbishments can quite often take months to complete as escalators are very complex creatures, as a typical one usually having 15,000 moving parts. The longest escalator is at Angel, measuring 60m long with a vertical rise of 27.5m, while the shortest is at Stratford, coming in at just 4.1m. 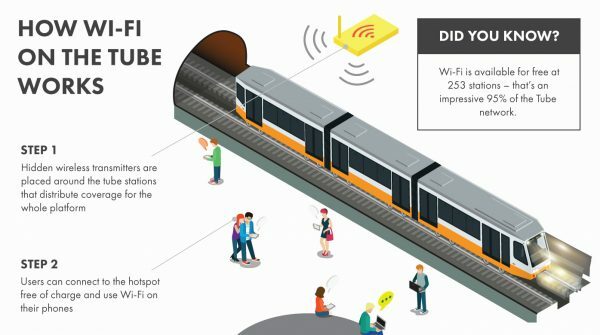 How does Wi-Fi on the Tube work? You have to admit that by now, we are all used to CONSTANTLY being online, thanks to 3G ad 4G mobile and ubiquitous WiFi. Hence, one of the major frustrations for Tube-travellers was the fact that no radio waves could penetrate the tunnels, meaning no WiFi. That was until the 2012 London Olympics! More people would be using the Tube than ever before, including a large portion of tourists and visitors. In order to help ease the inevitable congestion, wireless was finally bought to Underground. Wireless transmitters are placed around the tube stations at the ticket halls and platform which cover roughly 95% of the Tube networks. Most of you who are UK customers with contracts on EE (Orange and T-Mobile), Three, and Vodafone have complementary access, whilst those on any other network contracts can still have access by paying. However, these transmitters only reach the ticket halls and the platforms: there is no connectivity in the tunnels themselves while you’re on the train! The number of people using the Tube, whilst already considerable, is going to grow exponentially. For example, there was an 8.2% percent increase in the number of people using the Tube between 2008 and 2014 on an average day. This meant that over 26.6 million people travelled on the Underground on an average day at 2014. At this rate, by 2041 it is predicted that there will be an additional 5.5 million trips per day. That is A LOT of people, and shows London to be the ever-growing, metropolitan hub that it is. As newer technology is invented, it is certainly worth keeping an eye on how the Tube will integrate these developments. Who knows what the Underground might look like in 50 years?